A few nights ago we experienced a rare Pacific Northwest house-shaking BOOM of thunder which led our daughters quickly out of their bedroom in search for comfort, and answers. Their mom and I reminisced about our developed fondness for thunderstorms growing up in Indiana and Florida, and comforted them with a satisfying scientific lesson and assurance of God’s sovereignty. But, in the morning, our second oldest wanted MORE answers! Why do we suffer? My dad tells the story that one of his seminary professors in the 1960’s challenged his class to study the Scriptures to determine that very thing – why God allows suffering in the world. My dad, the young pastor, concluded from his study that Scripture identified five basic reasons why people suffer. He placed those five on a small piece of paper in his Bible as he visited people with some physical or emotional affliction. Over years of more study his small piece of paper grew into a detailed chart. He ultimately concluded that God’s Word gives 16 general reasons why people suffer in this world. Dad’s journey was years. I want everyone to have this in their hands right now. So, I have put his chart below, and have attached a printable Word document here. It is not a simple question, but it is a vital question for us to answer; and, one which will lead to glories, faith, peace, assurance, and convictions of many kinds. Please consider these 16 reasons prayerfully, and research the Scriptures for yourselves. Notice that there are some things God holds as more important than our comfortable circumstances – His glory, the fulfillment of His redemptive plan to eradicate evil, and our relationship with Him. By His grace He shares His glory with His children. In future glorification in heaven believers attain likeness to the glorified Christ and are freed from both physical and spiritual defect. We will never again experience bodily decay, death or illness, and will never again struggle with sin. We will see God as He is, face to face, and walk and reign and rule with Him forever. Right now, in the face of your struggles today, the delight of knowing Him and being His brings joy, peace, satisfaction, and contentment in this life, in all circumstances. If you grasp these truths, you will experience routine praise. You will not be shocked at any bad thing. You will say to suffering, the lower you lay me the higher you raise me. You will waste your suffering if you do not believe it is designed for you by God. You will waste your suffering if you think that “beating” it means staying alive rather than cherishing Christ. You will waste your suffering if you grieve as those who have no hope. You will waste your suffering if you treat sin as casually as you did before. You will waste your suffering if you fail to use it as a means of witness to the truth and the glory of Christ. But, it all starts with salvation from sin. Whether you are in a time of prosperity and comfort right now, or a time of suffering, pain, and disappointment, God says that we are all sinners and stand condemned without repentant trusting faith in Jesus Christ. But, Jesus suffered for our sins so that He may save us from our sins. So, don’t wait any longer. Repent of your sins and call on Him for salvation today. He will answer. Welcome to lc3life.com! If that sounds like a new website, it is. Kind of. We recently changed the name of the long running “lakecitysmallgroups.com” to “lc3life.com” primarily for the purpose of featuring new topics such as church planting, missions, and others which may come. But, I haven’t been able to post here until my dissertation on church planting was completed. I am happy to say… it is now completed! Video 1 contains my entire doctoral dissertation defense/presentation, held on Saturday, April 22, 2017 at Lake City Community Church in Lakewood, WA. The video includes an introduction from Corban University Doctor of Ministry Director, Dr. Leroy Goertzen, and a time for questions and answers at the end. The 32-page presentation handout can be downloaded on PDF right here – PRESENTATION – Handout. The title of my dissertation is, “PREPARING TO PLANT SUCCESSFUL CHURCHES: DISCOVERING PREPARATION COMMONALITIES IN VIABLE CHURCH PLANTS IN WESTERN WASHINGTON STATE.” The entire 300+ page dissertation will be available for consumption in a couple months. Video 2 is an 8-minute clip from the full video above in which I discuss laying the theological foundation for church planting. Without that foundation, the research and the rest of our conversation doesn’t much matter. In the weeks, months, and years to come, I plan to add content from my research over the last three years to this blog, as well as new discoveries as Lake City Community Church proceeds on our church planting adventures, as God leads and directs. The conversation has begun. The prayers continue. Please join both! P.S. If you are reading this before May 7, you are invited to Graduation Open House at LCCC on Sunday, May 7, from 4:00 – 6:00 p.m. We want to thank the church for being so supportive, and celebrate the conclusion of one chapter and the opening of many new chapters ahead. Each Winter/Spring Semester we ask, “What extra opportunities should we create for our leaders who want to gather with other leaders this semester?” These gatherings have always been enjoyable and successful. While these events are not required for leadership like the fall and January training sessions, we think leaders, potential leaders, and those you are discipling should come! So, here’s what we have for this semester, for leaders, members, and everyone interested in connecting with one of our “spiritual families” at LCCC. 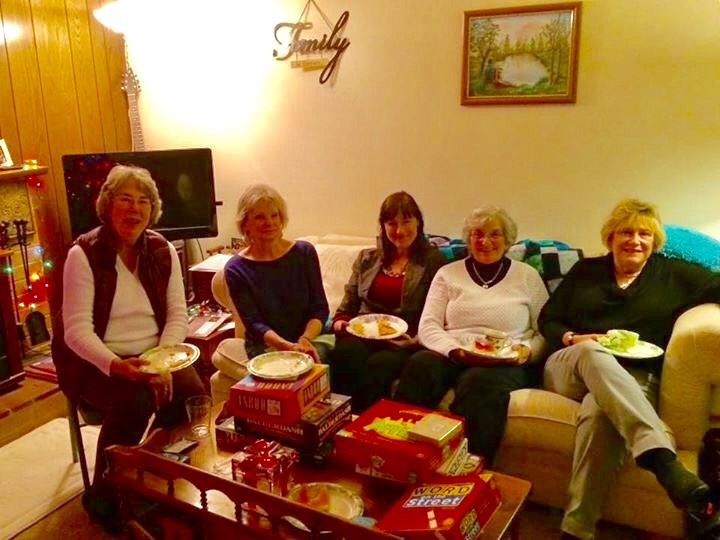 ANY time is a great time to connect in a Lake City Small Group. The groups marked “Room for More” on our website actually want you to join them right now! Mid-Semester Leader Fun Gathering, “Galvanize” – Friday, March 10, 6:00-8:00pm. Leaders, mark your calendars now. This will be a good one. More info and an e-vite coming soon. Prayer Meeting for Small Groups #1 – Sunday, March 12, 10:00am, Library. Open to anyone who wants to pray for our small groups. Prayer Meeting for Small Groups #2 – Sunday, April 30, 10:00am, Library. Open to anyone who wants to pray for our small groups. Easter – Sunday, April 16. Kicking off at least two exciting new groups during the week after Easter, open for anyone to join. June Small Group Leader End-of-Year Celebration! – Wednesday, June 14, on the lake, for all SG Leaders and families, 6-8pm. S. H.A.P.E. Class: Saturday March 18, 9am – 1:00pm – Discover how and why God made you for His purposes in your life. Women’s Retreat – April 28-30. Our small groups’ mission has remained, “To make disciples who make disciples in relational environments.” God blessed this fall in uncountable ways! With the culmination of the Happiness Series and other activities of the fall semester it was good to hear from different groups about how God used their time together to grow them in Christ, develop their relationships, and serve the world. Enjoy these testimonies and pictures! We shared a Christmas Potluck dinner with their group. Their special guest, Marlene Etter, shared about her last year in Niger and her ministry next year in Chad. We also sponsored a girls’ and guys’ night out. 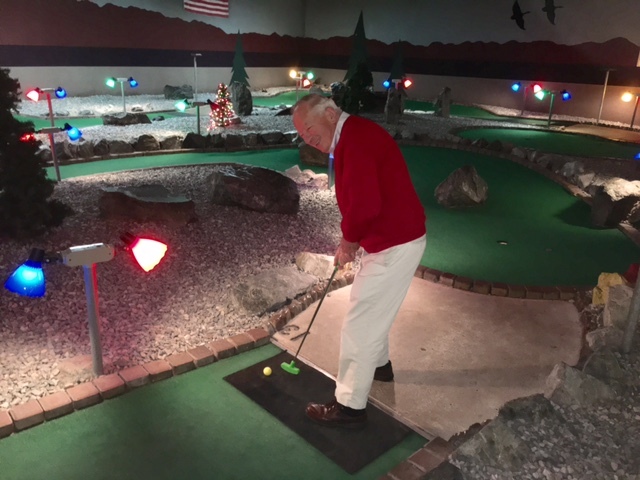 The guys met at Tower Lanes to show their expertise on the Putt Putt Course. The Girls met for game night at the Reynolds. 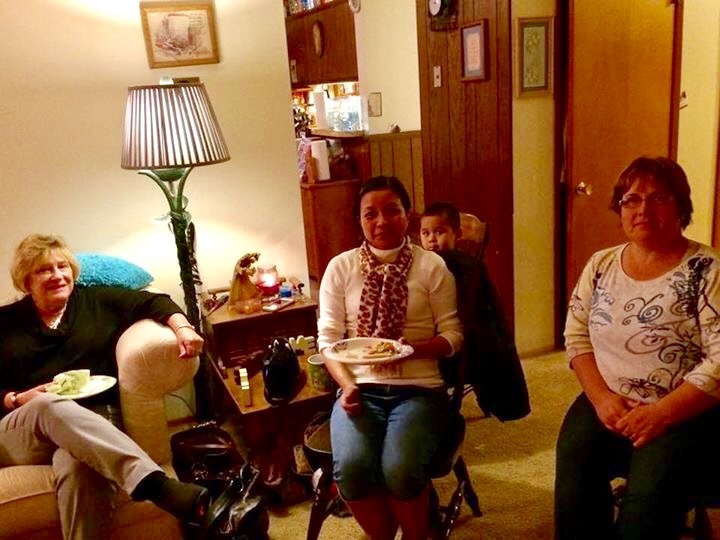 One of our members became a US citizen last month and we had a happy party and cake to celebrate with her.We also take 15 minutes each week for people to share about themselves so we get to know them better. It has helped us get closer to each other. Well, that and the food and fellowship at the end of the evening. We took on two missions this fall. One to provide meals to a couple that were both too ill to cook. We filled their freezer. Second was to support Eddie Johnson through Young Life. We ended the year with a potluck at our house. I asked Marlene Etter to talk for 15 minutes about her mission as a start to our supporting her next year. It was a lot of fun and well received. We will meet again on January 11, 2017 to begin a study on the Screwtape Letters by C.S. Lewis. For the past few years, my ministry partners and I host a Thanksgiving feast to our homeless friends. In past years, there have only been a couple of us to organize, buy, cook, and prepare all the items necessary to put on a huge feast. This year, my small group blessed the team and me by providing all of the side dishes, drinks and desserts! The feast went so smoothly. Our small group had been praying into this event and it couldn’t have been done so easily without their generosity and support! One of my Muslim friends was there and heard the message and now she wants to study the Bible! She was so happy to be around Christians. She was welcomed by all and made part of conversations that aren’t usual for a young, Muslim woman to have. After Eric’s message, she said “I want to be like him.” She wants to know God’s truth and share it with others! Please continue to pray and do spiritual battle for her. She will have much opposition (seen and unseen) if she starts seeking the True and Living God. Her last words to me today were “I am SO happy!” The only way to explain this is she experienced the love of Christ today. Two of our small group coaches went on a missions trip to Malawi in October. Coach Eric Von Barnau Sythoff (VBS) and his wife Julie operate a wonderful 501c3 organization there, the Passion Center for Children. Coach Brad Criswell joined Eric on a trip that was life-changing for him. Brad is now leading the LC4Malawi – Cram the Container Project, which launches on New Year’s Eve! Our coaches families celebrated the end of this fantastic Fall 2016 Semester with a Christmas party, caroling, and praising God for this ministry we get to share with all of you at Lake City Community Church! As groups break for the holidays for a well-deserved rest, here are the important dates that will kickoff the next semester. January 15 – 21 – Official SG Kickoff Week! What Does It Take to Lead a Small Group in 2016-2017? 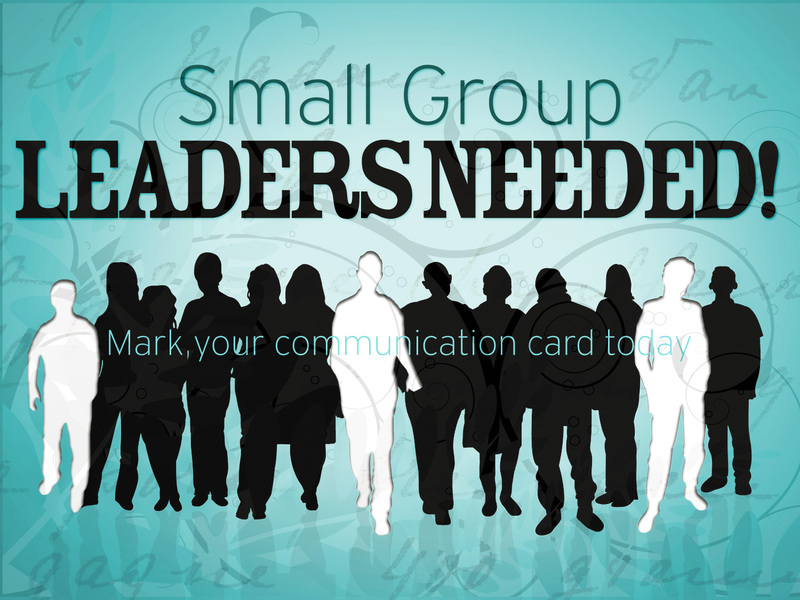 This “Small Group Leader Job Description” post has been updated for 2016. 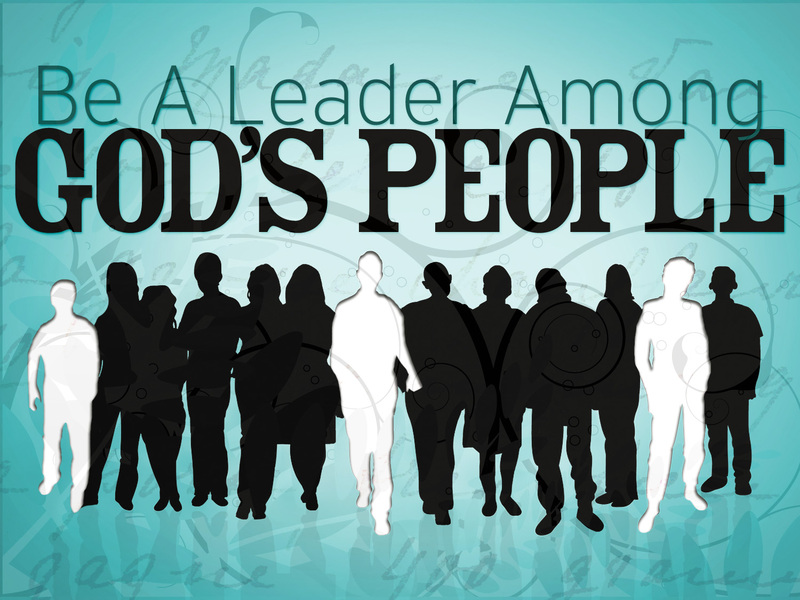 Are you considering using your God-given gifts to lead in the LCCC Family? Small Group Leader Fall Series Material Meeting is Sunday, August 24, 10:50AM (during 2nd service) in the Gym. It is primarily for small group leaders, but open to everyone. The LC3 Ministry Summit is Saturday, Sept. 13, 9am-1pm. It is for ALL ministry leaders of LCCC, including small group leaders. Lead the group meetings and ministry, and delegate responsibilities to group members as they are gifted. Build relationships by regularly contact group members between meetings (through phone calls, emails, cards, coffee, invite for dinner, notes on Facebook, etc.) Follow up with absent members to let them know they were missed (Think “shepherd” – Luke 15:1-7). Assess where each of your members is spiritually and what they need to grow. Meet with your coach monthly. Complete the simple, occasional evaluation reports requested by small groups pastor and elders. 1. As the small groups pastor, I or a coach sits down with everyone who expresses interest in leading or co-leading our small groups. We will come prepared with some resources like our Lake City Small Groups TOOLKIT, the semester calendar, answers to frequently asked questions, and an enthusiasm to answer your additional questions. 2. Because of the importance of this role, all leaders are designated a pastor (that’s me) and a coach who will walk with you through your growth as a leader and as a follower of Jesus. 3. Gatherings for extra training (if requested), prayer, and fun throughout the year! 4. Electronic sources like weekly emails, social media, and this blog are great tools for enhancing many aspects of small group leadership. 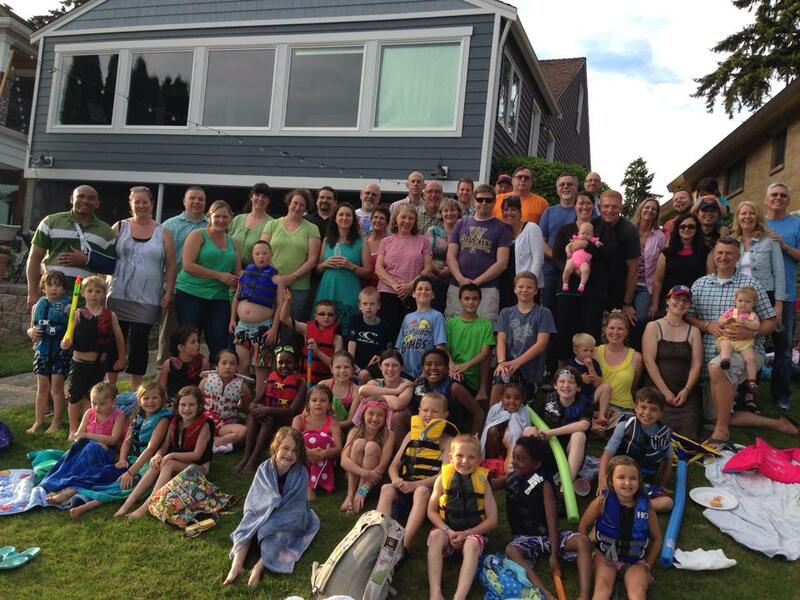 Lake City Small Groups: Making disciples who make disciples in relational environments. Summer Small Group News: What’s Ahead? We have an exciting announcement to make. The Church Leadership has selected for our All-Church Series for this coming Fall, 2016 –– Randy Alcorn’s Happiness! Since happiness is something all humans seek – Christians and non – the series will appeal to young and old church members and anyone we invite. We know Randy Alcorn’s material will take us deep into the Word, as it did in his Heaven series a few years ago. Our sermons will complement the material without overlapping the small group study, giving a fuller picture of each topic. Our youth and children’s groups will be doing this series, too, so it really is an all-church family experience. Of course, the creative arts, testimonies, outreach opportunities, and service projects will add to the momentum and unity as well. We look forward to bringing the church into a season of deep, victorious joy this year, right in the face of hard times and strong opposing spiritual forces. Here is a basic schedule of what’s ahead. More details will roll out in the coming weeks. August and early September are weeks to pray, prepare, and invite the community! Week of September 10/11 – Small Groups officially kick off! Week of September 24/25 – Happiness officially kicks off! Other Notes: Invitation materials will be ready in the coming weeks to invite friends and neighbors. Please pray for us as we prepare. And, enjoy the rest of your summer! This post is shared from LCCC’s Annual Report for the 2015/16 fiscal year. Enjoy the memories! Before groups kick off, each semester begins with much prayer, many conversations, and training. Our Family Pastor David Pritchard and I worked together again this year on our two annual all-church training/equipping events. First was the Summer/Fall Ministry Summit, a half day of multiple workshops on aspects of ministry skill, geared for leaders in every realm of church life and mission (not just small groups). Our friends from RLM, Post Falls, ID, came once again to do their specialty – discipleship training, with some counseling skills mixed in. Just over 100 attended this powerful and productive day of training which also includes several workshops to equip everyone for a great year of ministry. Second was the equally successful January Family Summit, which David writes about in his section. These will be repeated and expanded each year. Keep attending these Summits, as they expand in training emphasis! Our ministry year kicked off with our all-church sermon and small group series, once again. This time God led Pastor Jim to focus on trusting God in suffering, and Max Lucado’s series on the life of Joseph guided our journey. It was a good season in our church’s life and growth. For deeper digging we invited Western Seminary’s Dr. Todd Miles to lead a four hour workshop on “God and Human Suffering,” at the end of the sermon series. I and several small group leaders and coaches took a van trip last summer to receive some personal ministry coaching from RLM, in Post Falls, ID. Each of us committed to read their pastor’s excellent book, DiscipleShift, before the trip, in order to discuss it on the six-hour van trip. God blessed this adventure, and on the return home we crafted our new mission and vision statements for Lake City Small Groups. Our mission is to make disciples who make disciples in relational environments. Our vision is to be spiritually mature disciples who love God, one another, and the world. We applied these statements in our trainings, communication, and coaching conversations, and enjoyed a striking amount of clarity and unity among our small groups as a result. Pastor David and I continued successfully harmonizing small groups and the ReEngage marriage ministry. We want it to be clear and well-known that if you need to work on your marriage for a season, the sixteen to twenty weeks you spend in ReEngage serve wonderfully as your small group for that season. Thank you to the ReEngage leaders who worked so faithfully on discipling and shepherding the groups in your care. After the fall’s all-church focus leaders and groups have autonomy to define how they will make disciples who make disciples in relational environments, by the schedules, events, emphases and studies to which the Spirit leads them. This Winter/Spring Semester, numerous testimonies of service projects, answered prayer, and spiritual growth were shared from our 26 groups. Curriculums and topics of study covered by the groups included: Not a Fan, Jesus Was an Airborne Ranger, Feasts of the Old Testament, Alpha Course, Kingdom Story, Ray Vanderlaan series, Matt Chandler’s Apostle’s Creed, sermon review. A recap of this year would be incomplete without mentioning our first ever Small Group Photo Contest. Thank you, Coach Ray Pancho, for your vigor and leadership on that project. It accomplished your desired purposes: group fun, excitement, and unity. They were pretty fantastic, and you can check them out on the previous post on this blog. I can’t speak highly enough about the four men who served with me as small group coaches this year. 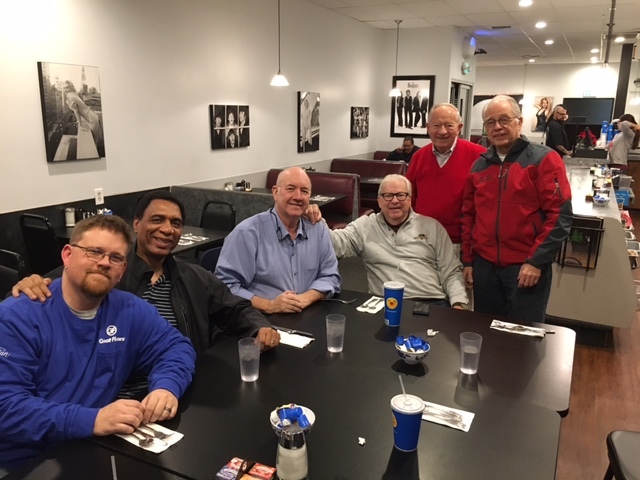 Tony Oury, Tyler Knack, Ray Pancho, Jeff Palomino and I met monthly to pray, assess, plan for ministry and edify one another. These men contribute enormously to our vision, trainings, decisions, and relational leadership. We focused on intensive Bible reading and prayer, accountability, visiting our groups, having our leaders over for dinner, and encouraging leaders to maintain the level of commitment and enthusiasm worthy of that position. Through this team of coaches every group leader was able to walk with someone through the ups and downs of their ministry year. On Wednesday, June 15 we ended the year with our annual end-of-year celebration of the past year. There was much to celebrate, plus a word from Pastor Jim about the all-church series this coming fall and the building construction to take place throughout the upcoming year. Thanking God for His blessings on our groups in 2015/2016, walking together to make disciples who make disciples in relational environments. Winter/Spring 2016 Photo Contest Results! January 17 – 23 – Official SG Kickoff Week! It’s always good to celebrate what God is doing in and through us. Take a minute to enjoy these fun reports and pictures from the semester that just ended! We’ve had 14 contacts you’ve sent of couples and singles. Of those, one is a missionary; another has two daughters entering mission work; one is an Army Chaplain who was able to connect with another who wants to become an Air Force Chaplain, and another who has also done mission work. We have quite a theme here! Fun Note: This group eventually called themselves the “RIBS Small Group” (Rejoice in Being Servants). We garnered help from our group for the Harvest Carnival and made tentative plans for a potluck. Next week we are going to start with the You’ll Get Through This video and then move outside around the fire pit for our discussion ending with s’mores (might be a good time for a visit-wink, wink). Sadly, I had to miss their s’mores night, but visiting the groups each semester is a personal highlight for me and our small group coaches. …Thanks for the kind word. You actually just caused me to Google the word shy and it’s funny because I’m a little too proud to say that about myself, but the definition fits: “Being reserved or having or showing nervousness or timidity in the company of other people.” It’s actually a little tough to swallow. But it’s a trait I have carried my whole life. Thank God He blessed me with an amazing family who I can be absolutely opened up to, without any shields or filters or fears. With them, I get to be a comedian, a rock star, a superhero. ReEngage has caused a focus shift in our marriage; we have both started to serve our spouse more, and put their needs and desires ahead of our own. We apologize out loud and ask forgiveness of each other when we mess up, and we are more gracious and patient in general. We are a team, and we spend intentional time together growing that bond. We love ReEngage! “You’ll Get Through This” has caused some interesting discussions. Our members are pretty good about sharing openly, and the trust level is getting high. We did the videos together, then split into men and women. This has worked very well as more open sharing has occurred. Separating guys and girls has worked out well for our group this Fall. Top moments this semester were singing with the children at the end of our meetings and sharing our testimonies. We have addressed many prayer needs in the group from strength to deal with an antagonistic coworker, to providing a partner for a mission trip, to dealing with a problem special education teacher, to serious health issues, to travel mercies. We have connected more outside of the group. You will be happy to know that we are starting an inner circle (leadership/discipleship team). This one is tonight! Care to join them?? The Justin and Blythe Thompson family, LCCC’s newest supported missionaries, toured most of the small groups this fall, meeting almost 300 people personally. We could go on and on, but suffice to say God was glorified and we were blessed in our community this year. So much more to experience in the Winter/Spring 2016 semester, which kicks off the week of January 17. If you are not in a group yet, join one by then! See how and start browsing now right here.